Exercise 1: Hand signals or verbals at 30 ft. and signal recall with distractions. Handler sends the dog 30 ft. (9.1 m) between distractions and then cues stand, down, and sit (in any order) followed by a recall. Purpose: Demonstrate understanding of verbal or hand signals at a distance, with fluency of work amidst distractions. Equipment: Two distractions (open food bowl with treats or toy), target (optional). Exercise set-up: Handler will place two accessible distractions 20 ft. (6 m) apart and 15 ft. (4.5 m) ahead of the starting point, and an optional target 30 ft. (9 m) straight ahead, creating a diamond shape. If target is not used, the 30-foot (9 m ) mark should be clearly demonstrated. The exercise begins when the handler cues the dog to move out directly to the 30-foot (9 m) mark or target. At that distance, the handler will give a single verbal OR hand signal for each position (stand, down, and sit, in any order), with a 2-second pause in between. The dog’s starting position may count as the first position. 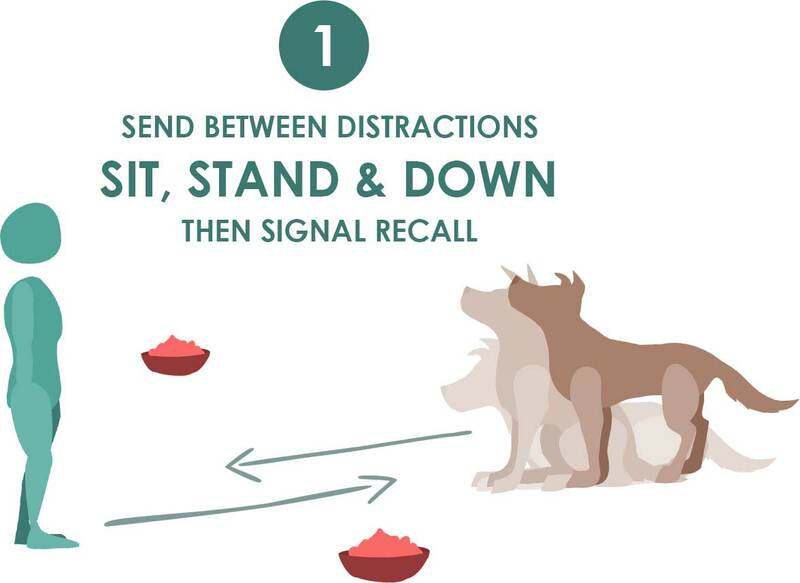 After completing the stationary exercises, the handler will pause for 1 second and then recall the dog to front or finish with a hand signal only. The exercise ends when the dog arrives in front or heel position. The dog will not be required to show a formal finish. Non-qualifiers: Dog does not go straight ahead 30 ft. when cued. Dog does not show each position (stand, down and sit) with one cue for each. Handler uses both verbal and signals, or uses multiple cues. Dog does not recall on a single signal. The dog approaches a distraction at any time during the exercise. Video does not permit the exercise to be adequately judged. Tip: If you place the distractions first and the target last, your dog is more likely to go straight ahead!